Prague is one of the most beautiful cities in Europe and in general lacks modern high rise buildings (with the notable exception of the television tower). By night it is especially picturesque and romantic. 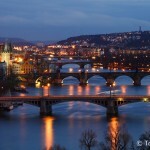 My first visit to Prague was in March 2008, where these photos were taken with a Canon EOS350D.